If I was still doling out titles for each episode, I’d call this one The Anatomy Lesson. 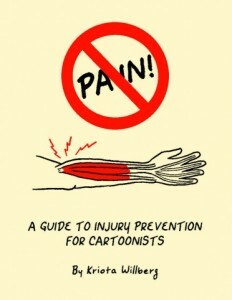 Kriota Willberg joins the show to talk about her work teaching anatomy, pathology, drawing, and massage, and her focus on keeping cartoonists from suffering work-related injuries (or art-related injuries, I suppose) through her minicomics and exercise programs. The conversation veers into the challenges of delivering pathology gags, making needlepoint of medical images, becoming a dancer and becoming an ex-dancer, learning not to let the perfect be the enemy of the good, growing up nerd in central Washington, and why it’s not good to tell jokes when you’re in the middle of surgery (okay, that last bit is one of my anecdotes). Give it a listen! BONUS: Science fiction writer/critic Paul Di Filippo comes in to talk about The Black Mill: Issue Zero Kickstarter that he just launched with Orion Zangara and Derek L. Chase. It finishes March 8, 2016, so check it out and help launch an innovative, gorgeous SF graphic novel! Also, if you want to find out who Kriota’s reading nowadays and get a list of the books we talked about, join our Patreon and become a monthly contributor to The Virtual Memories Show! At the end of February, the new episode of our patron-only podcast, Fear of a Square Planet, will go up with a bonus segment about who Kriota’s reading lately and why. Through graphic narratives, writing, performance, and needlework, Kriota Willberg focuses on the intersection between body sciences and creative practice. In addition to body/science narratives, she makes self-care comics for artists ((NO) PAIN!, and First Aid for Drawing Injuries) and a minicomic series of little educational value, called Pathology Laffs. 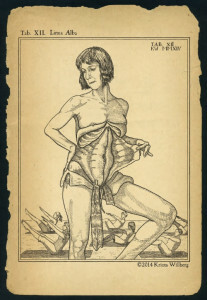 One of her blogs, thecinematologist.blogspot.com examines medical themes through the lens of Hollywood films. Willberg keeps her past as a dancer/choreographer alive by teaching anatomy in the dance department at Marymount Manhattan College. She is also a massage therapist working in the Integrative Medicine Service at Memorial Sloan Kettering Cancer Center. Her projects and opinions do not reflect the views of MSKCC. Kriota is working on a project called Pathographics, a soon-to-be-posting blog exploring the body, medicine, and history, through comics, and other visual narratives. This project is a collaboration between Cathy Leamy, Andrea Tsurumi, and Kriota. Credits: This episode’s music is Nothing’s Gonna Bring Me Down by David Baerwald, used with permission of the artist. The conversation was recorded at Ms. Willberg’s home on a pair of Blue enCORE 200 microphones feeding into a Zoom H5 digital recorder. I recorded the intro and outro on a Blue Yeti USB Microphone . Processing was done in Audacity and Logic Pro. Photo of Ms. Willberg by me.